Carla Marina Marchese is a beekeeper and honey connoisseur. She’s got a Weston farm, sells honey in Westport, and founded Red Bee honey and an accompanying blog. Today is National Honeybee Day. But we’re not celebrating. A thriving colony of bees in our apiary mysteriously perished without explanation. The incident is suspicious, and particularly disturbing because 2 days earlier this colony was alive and active. Since my apiary is just outside my honey house I can view the bees and their activity easily without going outside. In my 18 years of keeping honeybees, I have never had a colony of bees wiped out instantaneously. He was filming an episode for PBS that would feature Red Bee Apiary nationally. This was an incredible opportunity to showcase the importance of honeybees and their pollination activities, as well as the honey-making process. 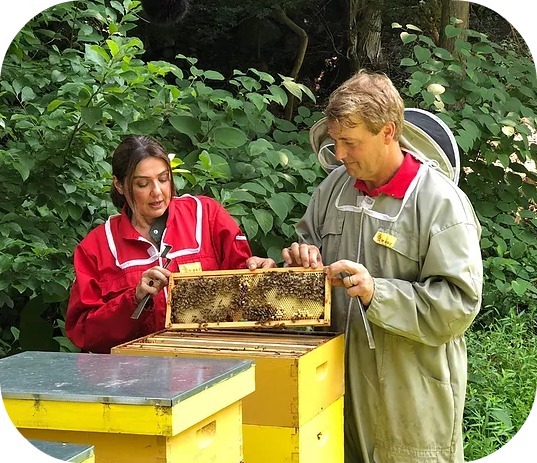 Carla Marina Marchese and Richard Wiese, at Red Bee apiary. We spent a glorious morning among the bees. We spotted the queens, watched as worker bees performed their ritual dances, and tasted fresh honey being made right before our eyes. Everything about honeybees is mesmerizing. Although one got under Richard’s bee suit, it added to the true experience and the magic of honeybees. On the Wednesday after filming, I took a walk over to the hives. I was alarmed to see a pile of dead bees cluttering the entrance board. More dead bees had poured like a waterfall onto the grass in front of the hive. I desperately ripped off the outer cover to look inside: a massive graveyard. I felt nauseated and destroyed. How could this happen? Thousands upon thousands of honeybees, silenced all at one time. My gut tells me they were exposed to nearby pesticide treatment. What if it was a neighbor spraying for weeds? Or the power company spraying to prevent growth along their power lines? The town very well could have been spraying for mosquitoes or ticks again. Right now I do not have answers. I have contacted our state bee inspector to take a look, and will send samples of bees to the lab for evaluation. Once I have answers, I will share them. There has been an overwhelming interest in the plight of honeybees and the use of pesticides in our environment. I posted pictures on Red Bee Honey’s Facebook page, and it went viral. It is heartening to see the outpouring of concern. Now more than ever we must fight to save the bees. This entry was posted in Environment, Media, People and tagged Carla Marina Marchese, Red Bee apiary, Richard Wiese. Bookmark the permalink. How many hives and was only one affected? Any sign of the Queen? And deformity to wings, legs etc.? Ughh, looks like classic pesticide poisoning. So very sorry. Some homeowner probably used powdered Sevin on their hydrangeas and the bees thought it was pollen. As a bee keeper in downtown Westport, I feel it’s better than not to be listed on the State Pesticide Registry. At least you get a heads up phone call the night before anyone with a professional applicator’s licence does something nearby. Even Terminex calls. But the state’s notification system is so far from adequate – and you have to re-apply every year to stay on it. 2. I doubt any commercial applicator would use sevin, let alone powdered sevin. It wouldn’t be productive. 3. What could possibly be the target on Hydrangeas that someone would use sevin? 4. Is there is more than one hive, wouldn’t they all be affected by pesticides or do hives claim keepsies on a plant so that other hives avoid them? Bob, I was merely trying to be helpful. As I pointed out, that Registry is merely better than a sharp stick in the eye. And I’m painfully aware that the Registry has no force of law upon homeowners. 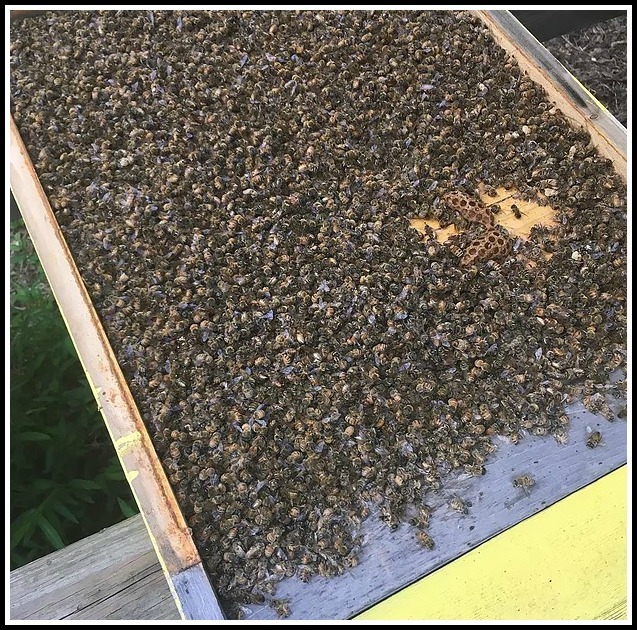 As a beekeeper for more years than I can recall, I’m no longer surprised by the stupid things people do with pesticides – it often comes in the form of advice from well meaning hardware stores. As for a dead out in one hive but not the others, bees have flower fidelity – I’ve noticed that sometimes applies to individual hives as well. It just seems to me, like most everything else in the world, people are jumping to a definitive conclusion without all thef facts being in. There was nothing definitive about my assessment. It was simply an informed comment based on a lifetime of direct, personal experience. The truth is, most beekeepers never have the luxury of all the facts surrounding a given situation and merely aspire to a reasonably durable theory. beekeeping than most people could ever remember… myself included. He merely stated that it maybe. Marina is also a beekeeper that has forgotten more than most beekeepers so it will be interesting what the the CT State Bee Inspector findings are. This has been a wacky year for beekeeping…nutty swarms…colony collapse …etc. pesticide poisoning and high mite counts. This is horrible! I hope you solve this mystery and that more bees aren’t affected. I am a bee lover and their plight is breaking my heart. I have planted my garden with bee friendly plants and let the clover grow in my lawn but the bees have been few and far between. I know my neighbors spray for ticks and the like. When will people learn that perfect lawns and gardens are not worth the cost to the bees and others. As a fellow beek, I am so sorry for your loss. My biggest fear is that one neighbor, one town employee, one lawn service will spray something in my neighborhood on a windy day that will destroy my hive. Please continue to give updates. Heart breaking, we aspire to be a green town, banning plastic bags, promoting solar, but have no guidelines on pesticides. I see opportunity for Town level involvement. I have a pollinator garden filled with natives and thanks to facebook I see activities on my flowers posted last year. Markedly less insects this year on my flowers,…, new neighbor spraying? Very sad to hear, and alarming. If the hives died because of a drift of spray, and at the moment that seems the most likely explanation, then all the living things in the area were exposed, too, including the humans. Kinda scarey. Sorry to hear about you bees dying. I am interested about the reason behind this. I think Mr stalling asked some great questions in post #1. Pesticides could be the problem, probable but unlikely. Actually it’s concerning the bees were handled less than one week before. I would start there. Possible introduction of many elements that would create this loss during the filming and handling. Keep us in the loop. Good luck. I had the same thing happen to me a month ago. I had a new queen in my queen castle, it was thriving and then a pile of dead bees. It was next to two nuns and not one of my other hives were affected. I gave up on getting calls from the companies spraying my neighbors properties because I got at least two calls a week. Since there was nothing I could do about it, I stopped the calls. I totally, totally hear what you are saying, Sandra. But there’s one thing you can do if you get a heads up call about pending spraying nearby. You can close your hives the night before if you think it’s something that represents a real threat. For instance, I have one hive sitting under the drip line of a giant hemlock hedge maintained by a utility company. So it gets drenched with dormant oil a few times a season. The oil is likely not really an issue for the bees per se, but I still close it up the night before the hedge is to be sprayed and ask the applicator to come as early as they can so the hive doesn’t overheat. Those robbing screens work well for this purpose because the bees can still fan the hive. That plus a screened bottom and a screened top and you can keep the bees pretty stable for long enough to get past Mr. Sprayer. It’s not a perfect plan; there’s always those field bees that spent the night out somewhere and return in the am to find the door locked – but it’s pretty good and beats the alternative.